Whether they were building towers or designing a clothing line, the students who participated in the 14th annual Tech TREK at Indiana State University had to use teamwork. Nearly 500 high school students from Indiana and Illinois competed for first, second and third prizes in their respective categories, including "Tower of Terror" and "Duct Tape Fanatic." Northview High School students Dustin Stevenson, Kodie Girton, Justin Rodgers and Landon Kaelber built a "Tower of Terror"-without talking. During the design part of the competition they could speak, but once they started building, all verbal communication ceased. They all agreed communicating without talking was rough, but they were able to rise to the challenge and take third place in the event. Coni Stanley, a judge for the "Tower of Terror" competition, even gave the teams permission to text as a way of communication. "I've only seen two people text," said Stanley, a program assistant for First Year Programs at ISU. "I did see one group use sign language." For "Junkyard Genius," students worked together to build gliders from discarded plastic soda bottles, feathers, balloons and tape. The goal of the project was to design the glider that would fly the greatest distance with a toy soldier still inside. Paul Schulz, a sophomore technology engineering and education student, allowed the students to give their gliders a practice flight. "Want to try her out, guys?" he asked the team from Evansville North High School, whose team members were starting to stress out with only 10 minutes left in the competition. The team, comprised of Andrew Will, Ethan Purkiser and Collin Welle, took first place in that competition. Other students from Evansville North created the fashion line "Designs in Every Direction" in "Duct Tape Fanatic." In this challenge, students were required to design a t-shirt that represented their high school-using duct tape, construction paper and pipe cleaners. Ashley Sullivan, Kayla Dean and Julie Ringwall used teamwork to create their t-shirt, but that wasn't the hardest aspect of the competition. "The challenging part was getting it done on time," Dean said. Their design featured a compass rose on the front with the needle pointing north for Evansville North. 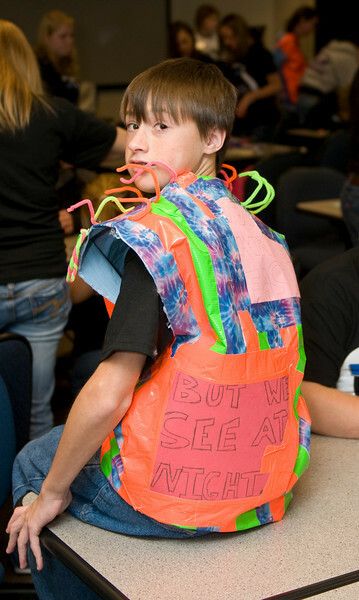 As part of "Duct Tape Fanatic," one student from each team had to model the apparel. This was Levi Hill's favorite part. His teammate, Aaron Brewer, modeled the Seymour High School design. "We wanted to make it colorful, something that stood out," Brewer said. While the team had some issues in the beginning stages, after a bit of teamwork, the pieces fell into place. Alexis Strain, a senior technology education major, helped the students throughout the duct tape competition and facilitated the fashion show. "My favorite parts of the competition are seeing all the kids doing the teamwork and working together and then the modeling, seeing them dance and get into it," Strain said. In the afternoon, students competed in the technology bowl, a Jeopardy-style game with teams comprised of the top four students from each school. The Greenfield Central High School team of Jordan Kieth, Zach Langons, Ben Vowell and Tom Branstetter successfully defended the golden bowl traveling trophy. More than 500 Wabash Valley students visited the ISU campus last week to compete for trophies and bragging rights in the College of Technology's 14th annual Tech TREK.